Key Difference: Niger and Nigeria are two different countries located on the continent of Africa. 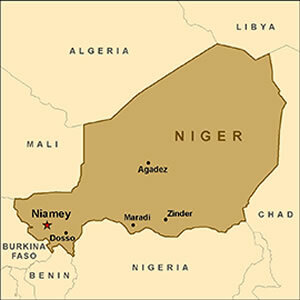 Niger is a land locked country in West Africa. In comparison, Nigeria is a costal country in Africa. They are neighbors that share a border. Due to how similar the names are, many people assume that Niger and Nigeria are the same and that the names are variations of each other. However, in reality, they are two different countries located on the continent of Africa. In fact, they are neighbors and are named as such because their names are based on the river Niger which flows through both the countries before emptying into the Gulf of Guinea. Niger is a land locked country in West Africa. It is bordered by Libya to the northeast, Chad to the east, Nigeria and Benin to the south, Burkina Faso and Mali to the west, and Algeria to the northwest. Niger got its independence from France in 1960, but was soon imbued in civil conflicts leading up to five different constitutions and three periods of military rule. Niger finally received some peace after a military coup in 2010, which led to the country becoming a military coup in 2010. However, Niger is still considered a developing country and is consistently one of the lowest-ranked in the United Nations' Human Development Index (HDI). The reason behind this is the fact that the country’s economy depends primarily on agriculture, but a third of the country’s land is desert, and the other parts are threatened by periodic drought and desertification. Another important part of Niger’s economy is the export of raw materials, especially uranium ore. However, the demand for uranium ore has slowed internationally. Niger also faces serious challenges to development due to its high fertility rates and resulting overpopulation without birth control, poor education and poverty of its people, lack of infrastructure, poor health care, and environmental degradation. In comparison, Nigeria is a costal country in Africa. It has Benin to the west, Cameroon to the southeast, Chad to the northeast, and Niger to the north. It has a large population, so much so that it is the most populous country in Africa and the seventh most populous country in the world. It also has one of the largest populations of youth in the world. Nigeria also has a large economy and is considered to be an emerging market by the World Bank, which has also identified as a regional power on the African continent. Nigeria is also considered to be a middle power in international affairs as well as believed to be an emerging global power. Due to this and its large population and economy, the country is often referred to as the “Giant of Africa”. Nigeria is also listed among the "Next Eleven", which are a list of economies that are set to become among the biggest in the world. In addition, Nigeria is also a founding member of the African Union and a member of many other international organizations, including the United Nations, the Commonwealth of Nations and OPEC. 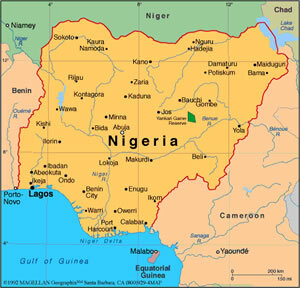 Nigeria gained its independence from the British in 1960, who have had a lot of influence on the country. However, the culture of Nigeria is still present and celebrated in the region. The country is inhabited by over 500 ethnic groups, of which the three largest are the Hausa, Igbo and Yoruba. Due to this, there are over 500 different languages that are spoken within the country. However, due to British presence, the official language is English. Niger is bordered by Libya to the northeast, Chad to the east, Nigeria and Benin to the south, Burkina Faso and Mali to the west, and Algeria to the northwest. Has a southern coastline on the Gulf of Guinea, and has Benin to the west, Cameroon to the southeast, Chad to the northeast, and Niger to the north. Niger's subtropical climate is mainly very hot and very dry, with much desert area. In the extreme south there is a tropical climate on the edges of the Niger River basin. Nigeria has a varied landscape. The far south is defined by its tropical rainforest climate. Coastal plains are found in both the southwest and the southeast. Concentrated around subsistence and some export agriculture clustered in the more fertile south, and the export of raw materials, especially uranium ore.